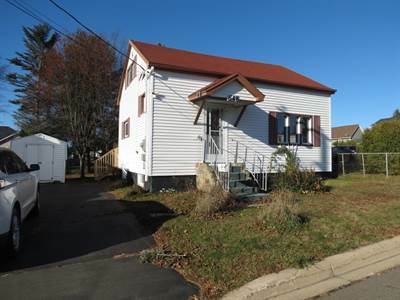 CUTE PROPERTY IN THE HEART OF DIEPPE AND WALKING DISTANCE TO ALL AMENITIES! • 1200 sqft , 1 bath , 2 bdrm 1 1/2 story – FOR SALE CAD104,900 . GREAT PRICE! AFFORDABLE 2 BEDROOM HOME IS WALKING DISTANCE TO CHAMPLAIN MALL AND AMENITIES! This 1.5 storey home is ideally located in the heart of Dieppe and within walking distance to all amenities and easy access to the public transit system. This home is situated on a dead-end street, on a landscaped lot with mature trees, baby barn and a paved driveway. On the main floor of this home you will find a large living room, eat-in kitchen, large 4pc bathroom with laundry hookups and a spacious mudroom in the back accessing the deck. The upstairs features 2 bedrooms and a loft. The basement has one finished room and an unfinished room for workshop and utility room. Heating is baseboard electric with a breaker panel. Flooring consists of hardwood, ceramic tiles and laminate. Don’t delay, at this price this cute home is not going to last long. Call today for your private viewing!